I thought I would be forced to pick early but I seem to have got by with little damage and really rich fruit. Every animal and bird is so busy with mulberries I’ve been picking cherries behind their backs and not lost a single cherry to them that I know of. 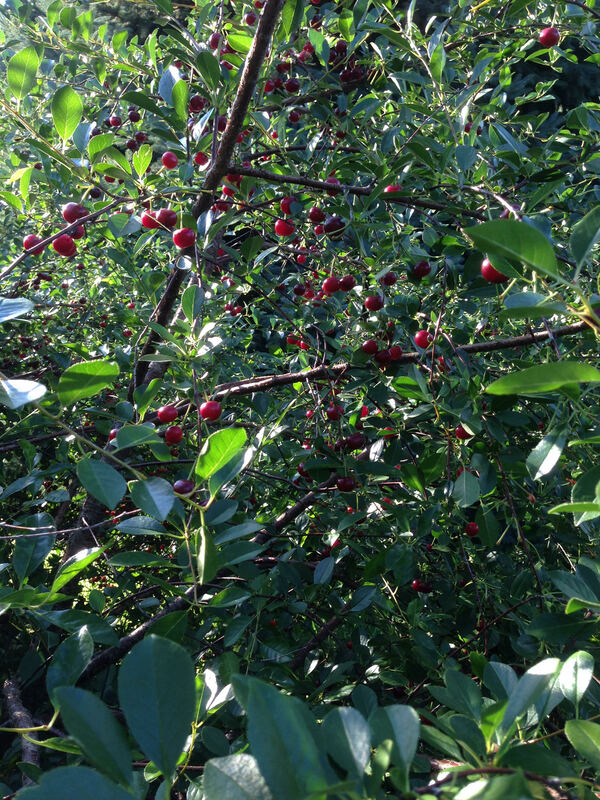 The insects got around 1% of the cherry crop. No losses to weather. A few cherries were occasionally lost due to rot. 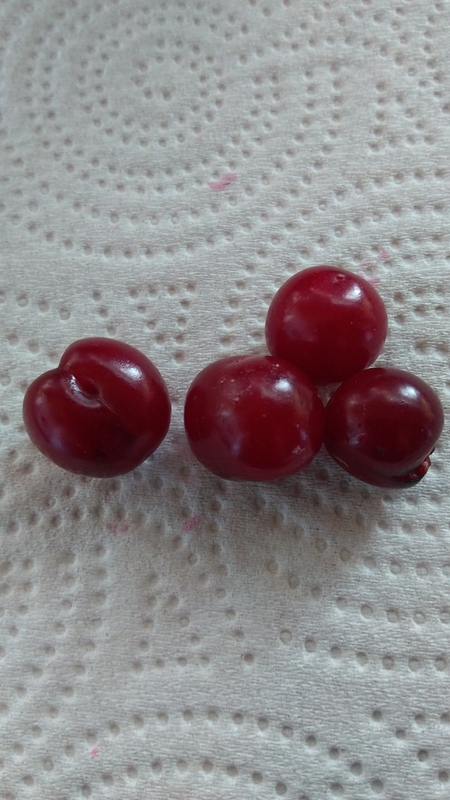 I only got a few cherries off of my Jubileum, so I chopped it after many years-8/10? You seem to be getting a lot more than I did. I agree they taste good. Where are you? 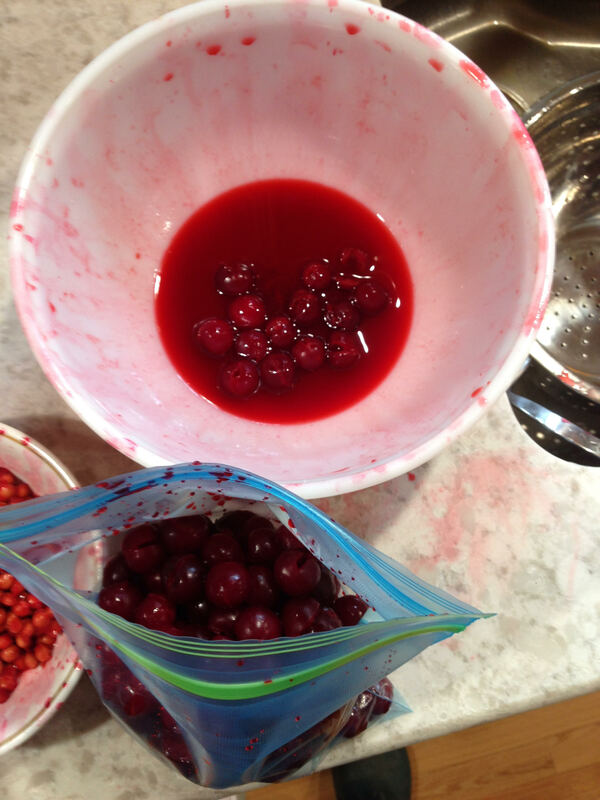 Jubileum didn’t produce more than a few cherries a year for me so I chopped it. Balaton seems to be more productive as far as the new Hungarian pie cherries go. Northeast Ohio. Maybe since they’re grafted onto a Surefire they were better pollinated. Speaking of Surefire, I just picked some today. This was the first time I netted them. They were able to ripen up nicely and were red all the way through. This was also a good year for blossoms being free from frost. We probably only get lucky once every five years in that regard. 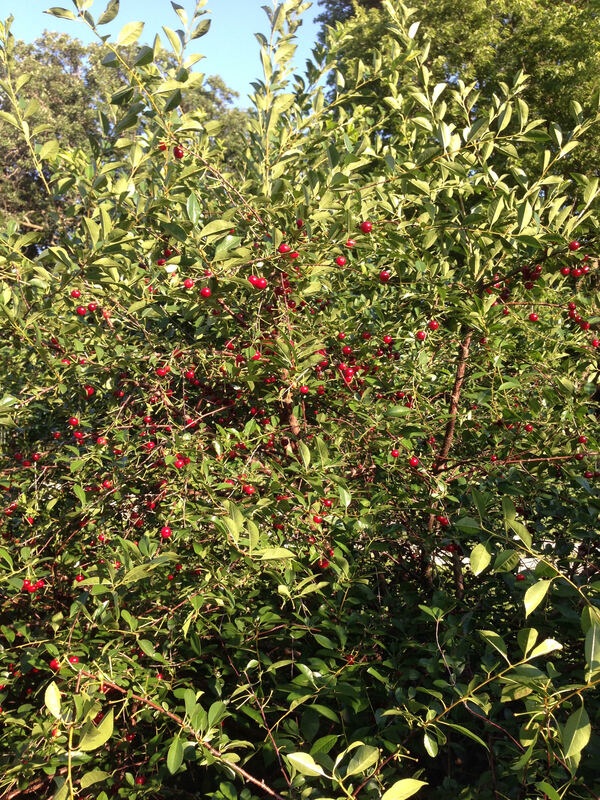 The one CJ of mine did produce more fruit since planting,3-4 years ago,with about two dozen cherries. Covering the bush with plastic during the wet Spring,most likely did help. I picked a few today and like the flavor,maybe more than the one Juliet sampled a couple weeks ago,but that is no real test. i cant wait for cherries. thought my montmorency was dead but i went by it the other day and there was a new shoot that came out near the base. i cut the rest off a in. above as it was dead. im glad it made it. it over wintered in a pot in my unheated garage. went by it today and its 8in. long already. same thing happened to my 1st juliet, except i only lost 6in. on it. I have a few CJ’s left on my three year old bush. I ate this one right after taking the picture. I was afraid the birds or chipmunks would get them and had to do it. It didn’t have any cherry flavor at all and was watery. That made me decide to wait with any of the others. I know that feeling all to well. I am also waiting for the too many cherries problem, lol! Thats really high brix for a sour cherry, was this the juliet or CJ? I remember one of the breeders of Carmine Jewel commenting that warmer summers produced sweeter fruit… I wondered at the time what that would mean for cherries grown well south of Canada as many here are doing. Maybe they get a lot sweeter? i hope so , tho im not that far south of canada . about 1000 yards. Their chart on slide 109 indicates they have observed brix readings as high as ~18 for Carmine Jewel. Perhaps a warmer environment could bring that up by 4? I know there is a lot of talk about brix which normally I don’t test due to our fruit always being being higher than normal in sugar. Our summers stay in the 90’s and seldom dip below that point and the sun makes it feel hotter than it is. We are easily above 100 many days during June, July, and August. It’s so warm I make yogurt outdoors right now which needs 6 hours of steady 100 degree temps. 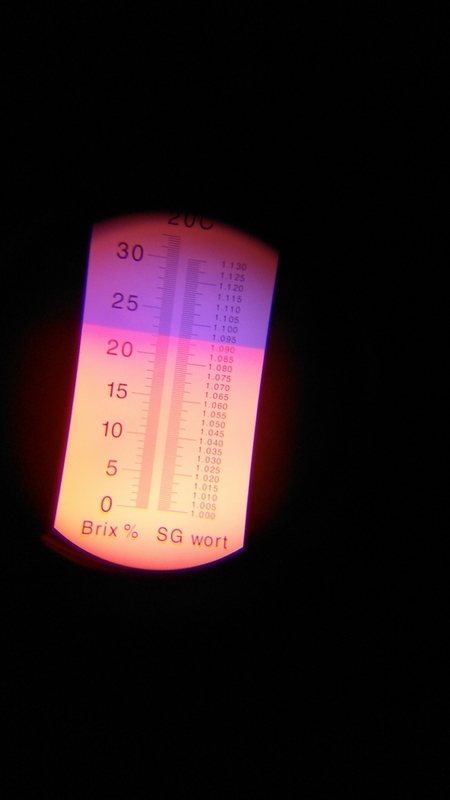 For those scratching their heads when we refer to brix please read up on it at this link http://www.grapestompers.com/refractometer_use.aspx. If I have time I will check brix on mine but I’m confident it’s higher than normal. So many people have brought it up I’m kind of curious myself now. My refractometer was expensive years ago when I bought it from amazon. I’ve used it rarely. I picked a little over two quarts this year vs. 1 quart last year. Once again, though, I had to pick them earlier than I wanted due to all the rain (about 6" since June 1). My average brix was only about 13. I still enjoy eating them fresh, but my wife made a pie that was really good. With all the rain, I can’t believe my Black Gold cherries are still hanging on. About 30% have cracked but callused over. Of course, it has rained quite a bit today so they may be worse tomorrow. That looks delicious! You know your making us drool right? We’re nearing the end of our CJ harvest for the year. As of today we’ve taken 49 gallons off of 5 bushes and it looks like there’s up to 20 more still out there. The JB’s are coming at us hard now, and I have to start on my Early Richmond tree ASAP!! These CJ’s have been subjected to an awful lot of rain recently, and I have a ton of rain cracked cherries that I’m tossing out onto the lane, and we’re still getting a record-setting harvest. Their deep color and dead ripe hasn’t equated to a high brix number for me. Knowing it needed done, and assuming I’d suffer some loss in production I cut 3 & 4’ off these bushes this spring, and I also removed some of the interior branches to try and get them to a more manageable height and to allow for better air flow. I thought (and still do kinda) that I made a big mistake in opening them up, as the fruit load was so heavy that with the absence of interior branches to intertwine, a lot of the branches just fell to the ground under load. But after removing almost 50 gallons and seeing some of the branches return to upright, I’m not sure with this heavy fruit load that they wouldn’t have suffered under the load anyway. They sure seem relieved once a lot of the branch is picked! I also think the severe haircut I gave them spurred some growth. 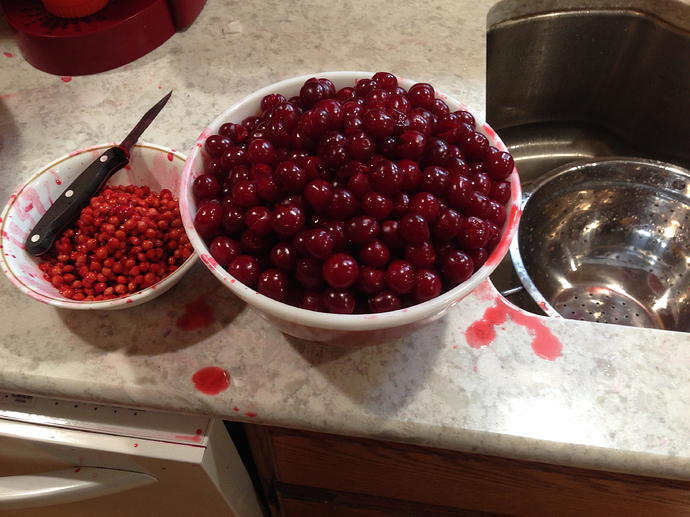 In any case, if we didn’t pick another cherry off them the 49 gallons equates to 44.1 pounds per bush. I’ve blasted out a text to some folks to see if anyone is interested in getting cherries so the overall take may increase some, just not by my hand - I just have to get on the ER really hard. I’m betting all that water you’ve got in Iowa is watering down the sugar levels. Once in awhile we grow cantaloupe and it never fails we get a good run of sweet melons and then it rains and the water content is up and the sugar is down and we throw the others over the fence in the compost pile. Iowa never gets as warm as Kansas. I had a friend move there to grizwald once and said it was the most pleasant summer ever. The only place I’ve ever been to that is hotter and more miserably humid than Kansas in the summer is the gulf around the Beaumont Texas / Louisiana border. Florida gets hot & humid but that part of Texas is unbearable. I promise if I saw a tomato or fruit etc. for sale my brakes would have left marks. That hot weather grows tomatoes in Kansas and other hot climates like nothing you can eat elsewhere. Georgia is hot and those Georgia peaches and Vidalia onions are like nothing else they are so delicious. There are many imposter fruits and veggies but those of us who know the difference know what I mean when I talk about a real peach! Tomatoes in hot weather are deep and rich flavored and I prefer Rutgers, brandy wine, black tomatoes, Amish pink eggs or yellow pears. That’s quite a crop of cherries! You are very fortunate this year you’ve been blessed with a good harvest. I’m like you these carmine jewell bushes sure do make us look good at growing cherries! I’m giving all the credit to the bushes! As long as I don’t short them on cow manure and wood chips they don’t short me on cherries.